Outstanding effects by master Ray Harryhausen in this sci-fi classic. See the saucers destroying Washington D.C. and buzzing cars on the highway. Great stuff! EARTH VS. THE FLYING SAUCERS (1956/Goodtimes/LP). 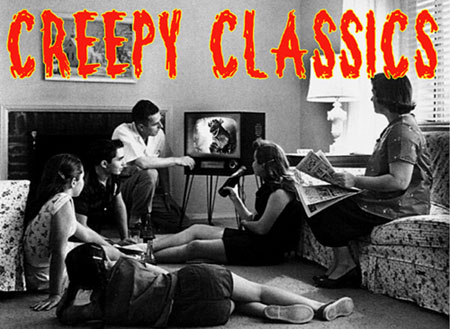 A classic 1950s teenagers-meet-the-giant-monster flick. Inside a cave, it's giant cobwebs and human skeletons! The spider is one nasty monster the size of a small house. Used, but like new, just no shrink wrap. ED WOOD (Tim Burton Film) (Johnny Depp/Touchstone/SP). The story of the worst film director of all-time, Ed Wood. His working with Bela Lugosi and taking the movie industry by storm with sheer will power. If not totally accurate, very fun. Feature lenge documentary. Vampira, Gregory Walcott, Paul Marco, Cona Brooks, Harry Thomas, Carl Anthony, Mrs. Tom Mason, Tony Randel, Joe DAnte and many more talk about Ed Wood. Narrated by Gary Owens. A great documentary on Ed Wood's feature films. The true story of Hollywood's most eccentric filmmaker. A caveman has survived evolution and aging for thousands of years on the California desert all alone. Ah, right. Plus swinging tunes from Arch Hall, Jr. Put the pizza in the oven and get some friends together -- go ahead, you can take it. Stars Maureen Brown and Gin Mart. Creepy Italian film with a cloaked madman who wears a skull mask and black robe lives in an underground sub-basement below a monastery. He kidnaps young girls and, well....you guessed it -- embalms them. Twisted Italian chiller. EMPIRE OF THE ANTS (1977/Joan Collins/Goodtimes/LP). ESCAPE FROM THE PLANET OF THE APES (1971 Playhouse Video/SP). Claude Rains and Fay Wray in a little known supernatural film. Rains is a phony mind reader who suddenly begins to have real visions and revelations to his dismay and torment. Note: EVIL MIND has some slightly different scenes than the British cut called THE CLAIRVOYANT. The story of King Arthur and the Knights of the Round Table! The magic sword, the stone and the adventure and spectacle of a lifetime.